This article is about the film. For the franchise, see Wreck-It Ralph (franchise). Wreck-It Ralph is a 2012 American 3D computer-animated comedy film produced by Walt Disney Animation Studios and released by Walt Disney Pictures. It is the 52nd Disney animated feature film. The film was directed by Rich Moore, who also directed episodes of The Simpsons and Futurama, and the screenplay was written by Phil Johnston and Jennifer Lee from a story by Moore, Johnston, and Jim Reardon. John Lasseter served as the executive producer. The film features the voices of John C. Reilly, Sarah Silverman, Jack McBrayer and Jane Lynch and tells the story of the eponymous arcade game villain who rebels against his "bad-guy" role and dreams of becoming a hero. Wreck-It Ralph premiered at the El Capitan Theatre on October 29, 2012, and went into general release on November 2. The film was a critical and commercial success, grossing $471 million worldwide against a $165 million budget and winning the Annie Award for Best Animated Feature, as well as receiving nominations for the Golden Globe and Academy Award for Best Animated Feature. The film was released on Blu-ray and DVD on March 5, 2013. 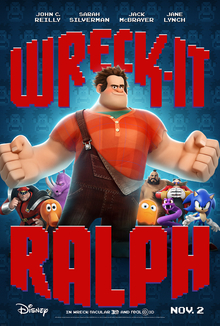 It is the first installment in the Wreck-It Ralph film series. A sequel, Ralph Breaks the Internet, was released on November 21, 2018. When Litwak's Family Fun Center & Arcade closes at night, the various video game characters leave their normal in-game roles and socialize in a power strip. Wreck-It Ralph, the antagonist of the game Fix-It Felix Jr., is ostracized by its other characters for being the game's villain, while the titular hero Felix is praised and awarded medals. After the game's inhabitants exclude Ralph from their thirtieth anniversary party, he sets out to earn a medal for himself to gain his neighbors' respect. Felix worries that Ralph has "gone Turbo" – a term coined when notorious racing game character Turbo attempted to take over RoadBlasters out of jealousy, which resulted in both of their games being unplugged. Ralph learns he can obtain a medal from the first-person shooter, Hero's Duty. After disrupting a game session, Ralph scales the game's central beacon and obtains a medal, only to hatch a Cy-Bug, a dangerous enemy. Ralph and the Cy-Bug stumble into an escape pod, which is launched out of the game, and crash land in Sugar Rush, a confectionery-themed kart racing game. With Ralph missing, his game is labelled as malfunctioning and faces being unplugged. Felix ventures to Hero's Duty and allies with the game's heroine, Sergeant Calhoun, to find Ralph and the Cy-Bug. A young girl, Vanellope von Schweetz, steals Ralph's medal to buy her way into the nightly race that determines which characters are playable the next day, but King Candy, the ruler of Sugar Rush, forbids her from racing because she has glitches that cause her to teleport erratically. Ralph reluctantly agrees to work with Vanellope to retrieve his medal and help her win a race. They build a kart and hide out at Diet Cola Mountain, an unfinished race track, where Ralph teaches her to drive. King Candy hacks the game's code to obtain Ralph's medal, and offers it to Ralph in exchange for preventing Vanellope from racing. He explains that if Vanellope wins, she will become playable and falsely tells Ralph her glitches will lead to Sugar Rush being unplugged; unable to leave the game because of her glitch, Vanellope will be left to die while King Candy and his subjects become homeless in the arcade. Ralph, foolishly believing King Candy, reluctantly agrees and destroys Vanellope's kart. Heartbroken, she declares he "really is a bad guy" and runs off distraught. Upon returning to his game, which has been evacuated in anticipation of it being unplugged the next morning, Ralph notices Vanellope's image on the side of the Sugar Rush cabinet and realizes she was meant to be a playable character until King Candy had apparently disconnected her code to render her a glitch, and erased all of the other characters' memories of her, resulting in her becoming a hated outcast. Meanwhile, Felix and Calhoun search Sugar Rush for Ralph. Felix falls in love with Calhoun, but she abandons him when he inadvertently reminds her of her late fiancé who was murdered by a Cy-Bug on their wedding day. Felix is later imprisoned in King Candy's castle, but Ralph frees him and Vanellope, and Felix repairs the kart. Calhoun discovers a swarm of Cy-Bug eggs underground, which hatch and start attacking the game. Vanellope participates in the race, but is attacked by King Candy. Vanellope's glitch causes him to be unmasked as Turbo, who took over Sugar Rush and displaced Vanellope as the main character. Vanellope glitches to escape Turbo, who is then eaten by a Cy-Bug. Ralph, Felix, and Calhoun evacuate the game, but Vanellope is trapped due to her glitches. When Calhoun points out that the Cy-Bugs can be attracted and destroyed by a beacon of light as in Hero's Duty, Ralph decides to make Diet Cola Mountain erupt, replicating the beacon. Ralph is confronted by Turbo, now fused with the Cy-Bug that devoured him. Ralph makes the mountain erupt and falls into its depths to sacrifice himself, but Vanellope saves him using her glitching ability. The eruption lures and permanently destroys the Cy-Bugs and Turbo. Vanellope crosses the finish line, rebooting Sugar Rush and restoring her status and memory as Princess Vanellope, the main character of the game, but keeps her glitching ability. Ralph and Felix return home and their game is spared. Felix and Calhoun marry. Vanellope gains popularity as a playable character, and a content Ralph gains respect from his fellow characters. John C. Reilly as Wreck-It Ralph, a gigantic but soft-hearted man who is the villain of the fictional arcade game Fix-It Felix Jr.
Sarah Silverman as Vanellope von Schweetz, a racer/glitch in Sugar Rush. Jack McBrayer as Fix-It Felix Jr., a repairman who is the hero of Fix-It Felix Jr.
Jane Lynch as Sergeant Tamora Jean Calhoun, the lead character of Hero's Duty. Alan Tudyk as King Candy, the ruler of Sugar Rush who is revealed to be Turbo, an infamous character from another kart racing video game known for having crashed another game out of jealousy. King Candy's vocal stylings are based on comedian Ed Wynn, and his physical mannerisms are modeled from Wynn's Mad Hatter character in Alice in Wonderland. Mindy Kaling as Taffyta Muttonfudge, a racer in Sugar Rush. Joe Lo Truglio as Markowski, a soldier from Hero's Duty that Ralph meets in Tapper. Ed O'Neill as Mr. Stan Litwak, owner of Litwak's Family Fun Center & Arcade. Dennis Haysbert as General Hologram, a holographic general in Hero's Duty. Adam Carolla as Wynnchel, a Long John who is a member of the Sugar Rush police department. Horatio Sanz as Duncan, a doughnut who is a member of the Sugar Rush police department. Rich Moore as Sour Bill, King Candy's sour ball henchman. The cast also includes the Fix-It Felix Jr. Nicelanders, Edie McClurg as Mary, Raymond S. Persi as Mayor Gene, Jess Harnell as Don, Rachael Harris as Deanna, and Skylar Astin as Roy; Katie Lowes as Candlehead, Jamie Elman as Rancis Fluggerbutter, Josie Trinidad as Jubileena Bing-Bing, and Cymbre Walk as Crumbelina DiCaramello, racers in Sugar Rush; Phil Johnston as Surge Protector, Game Central Station security; Stefanie Scott as Moppet Girl, a young arcade-game player; John DiMaggio as Beard Papa, the security guard at the Sugar Rush candy-kart factory; Raymond Persi as a Zombie, Brian Kesinger as a Cyborg (based on Kano from Mortal Kombat) and Martin Jarvis as Saitine, a devil-like villain, who attends the Bad-Anon support group; Tucker Gilmore as the Sugar Rush Announcer; Brandon Scott as Kohut, a soldier in Hero's Duty; and Tim Mertens as Dr. Brad Scott, a scientist and Sgt. Calhoun's deceased fiancé in Hero's Duty (voiced by Nick Grimshaw in the UK version but not in the UK home release). The film features several cameos from real-world video game characters including: Root Beer Tapper (Maurice LaMarche), the bartender from Tapper; Sonic the Hedgehog (Roger Craig Smith); Ryu (Kyle Hebert), Ken Masters (Reuben Langdon), M. Bison (Gerald C. Rivers), and Zangief (Rich Moore) from Street Fighter II; Clyde (Kevin Deters) from Pac-Man; and Yuni Verse (Jamie Sparer Roberts) from Dance Dance Revolution. A character modeled after dubstep musician Skrillex makes an appearance in the fictional Fix-It Felix Jr. as the DJ at the anniversary party of the game. The "Bad-Anon" villain meeting features various well-known video game characters, including Bowser, Clyde, Doctor Eggman, M. Bison, Neff, and Zangief. In addition to the spoken roles, Wreck-It Ralph contains a number of other video game references, including characters and visual gags. The video game villains at the support meeting, in addition to those mentioned above, include Bowser from the Mario franchise, Doctor Eggman from Sonic the Hedgehog, and Neff from Altered Beast. Additionally, the game cabinet of the fictional Fix It Felix, Jr. arcade game is stylized to strongly resemble the cabinet of Nintendo's original 1981 Donkey Kong arcade game, with Ralph and Felix taking similar poses as Donkey Kong and Mario, respectively. The Hero's Duty game is a reference to the hugely successful first-person shooter games Halo and Call of Duty. Characters from Q*bert, including Q*bert, Coily, Slick, Sam, and Ugg, are shown as "homeless" characters and later taken in by Ralph and Felix into their game (Q*bert also speaks to Felix at one point using the signature synthesized gibberish and word-balloon symbols from his game, called Q*bert-ese). Scenes in Game Central Station and Tapper's bar include Chun-Li, Cammy and Blanka from Street Fighter, Pac-Man, Blinky, Pinky, and Inky from Pac-Man, the Paperboy from Paperboy, the two paddles and the ball from Pong, Dig Dug, a Pooka, and a Fygar from Dig Dug, The Qix from Qix, Frogger from Frogger, and Peter Pepper from BurgerTime. Lara Croft and Mario are also mentioned. Additional references are based on sight gags. The residents of Niceland and the bartender from Tapper are animated using a jerky motion that spoofs the limited animation cycles of the sprites of many eight- and sixteen-bit arcade games. King Candy uses the Konami Code on an NES controller to access the programming of Sugar Rush. Throughout Game Central Station is graffiti that includes "Aerith lives" (referencing the character of Aerith Gainsborough from Final Fantasy VII), "All your base are belong to us" (an Engrish phrase popularized from the game Zero Wing), "Sheng Long Was Here" (referencing an April Fool's joke around a made-up character Sheng Long from Street Fighter), and "Jenkins" (a nod to the popular Leeroy Jenkins meme from World of Warcraft). There is also a reference to the Metal Gear series when Ralph is searching for a medal in Tapper's Lost and found, finding first a Super Mushroom from the Mario franchise, and then Metal Gear Solid's "Exclamation point" (with the corresponding sound effect from the game). Mr. Litwak wears a black and white striped referee's shirt, a nod to the iconic outfit of Twin Galaxies founder Walter Day. One of the songs in the credits is an original work from Buckner and Garcia, previously famous for writing video game-themed songs in the 1980s. The Walt Disney Animation Studios opening logo is animated in an 8-bit pixelated fashion, whereas the Walt Disney Pictures closing production logo appears in a glitched state, a reference to the kill screen from many early arcade games such as Pac-Man. The concept of Wreck-It Ralph was first developed at Disney in the late 1980s, under the working title High Score. Since then, it was redeveloped and reconsidered several times: In the late 1990s, it took on the working title Joe Jump, then in the mid-2000s as Reboot Ralph. John Lasseter, the head of Walt Disney Animation Studios and executive producer of the film, describes Wreck-It Ralph as "an 8-bit video-game bad guy who travels the length of the arcade to prove that he's a good guy." In a manner similar to Who Framed Roger Rabbit and the Toy Story films, Wreck-It Ralph featured cameo appearances by a number of licensed video-game characters. For example, one scene from the film shows Ralph attending a support group for the arcade's various villain characters, including Clyde from Pac-Man, Doctor Eggman from Sonic the Hedgehog, and Bowser from Super Mario Bros. Rich Moore, the film's director, had determined that for a film about a video-game world to feel authentic, "it had to have real characters from real games in it." Moore aimed to add licensed characters in a similar manner as cultural references in Looney Tunes shorts, but considered "having the right balance so a portion of the audience didn't feel they were being neglected or talked down to." However, Moore avoided creating the movie around existing characters, feeling that "there's so much mythology and baggage attached to pre-existing titles that I feel someone would be disappointed," and considered this to be a reason why movies based on video game franchises typically fail. Instead, for Ralph, the development of new characters representative of the 8-bit video game was "almost like virgin snow," giving them the freedom to take these characters in new directions. Before production, the existing characters were added to the story either in places they would make sense to appear or as cameos from a list of characters suggested by the film's creative team, without consideration if they would legally be able to use the characters. The company then sought out the copyright holders' permissions to use the characters, as well as working with these companies to assure their characters were being represented authentically. In the case of Nintendo, the writers had early on envisioned the Bad-anon meeting with Bowser as a major character within the scene; according to Moore, Nintendo was very positive towards this use, stating in Moore's own words, "If there is a group that is dedicated to helping the bad guy characters in video games then Bowser must be in that group!" Nintendo had asked that the producers try to devise a scene that would be similarly appropriate for Mario for his inclusion in the film. Despite knowing they would be able to use the character, the producers could not find an appropriate scene that would let Mario be a significant character without taking away the spotlight from the main story and opted to not include the character. Moore debunked a rumor that Mario and his brother character Luigi were not included due to Nintendo requesting too high a licensing fee, stating that the rumor grew out of a joke John C. Reilly made at Comic-Con.Dr. Wily from Mega Man was going to appear but was cut from the final version of the film. Overall, there are about 188 individual character models in the movie as a result of these cameo inclusions. An earlier draft of the screenplay had Ralph and Vanellope spending time going around the game world to collect the pieces for her kart for Sugar Rush, and at times included Felix traveling with the pair. During these scenes, Ralph would have lied to Felix regarding his budding relationship with Calhoun, leading eventually to Ralph becoming depressed and abandoning his quest to get his medal back. At this point, a fourth game world, Extreme Easy Living 2, would have been introduced and was considered a "hedonistic place" between the social nature of The Sims and the open-world objective-less aspects of Grand Theft Auto, according to Moore. Ralph would go there too, wallowing in his depression, and would find happiness by gaining "Like It" buttons for doing acceptable actions in the party-like nature of the place. Moore stated that while it was difficult to consider dropping this new game world, they found that its introduction in the second half of the film would be too difficult a concept for the viewer to grasp. They further had trouble working out how a social game would be part of an arcade, and though they considered having the game be running on Litwak's laptop, they ultimately realized that justifying the concept would be too convoluted. Line art sketches and voice-over readings of the scene were included on the home media release of the film. The film introduced Disney's new bidirectional reflectance distribution functions, with more realistic reflections on surfaces, and new virtual cinematography Camera Capture system, which makes it possible to go through scenes in real-time. To research the Sugar Rush segment of the film, the visual development group traveled to trade fair ISM Cologne, a See's Candy factory, and other manufacturing facilities. The group also brought in food photographers, to demonstrate techniques to make food appear appealing. Special effects, including from "smoke or dust," looks distinct in each of the segments. The film was originally scheduled for a release on March 22, 2013, but it was later changed to November 2, 2012, due to it being ahead of schedule. The theatrical release was accompanied by Disney's animated short film, Paperman. A teaser trailer for Wreck-It Ralph was released on June 6, 2012, debuting with Madagascar 3: Europe's Most Wanted and Rock of Ages. This also coincided with the 2012 Electronic Entertainment Expo, for which Disney constructed a mock aged arcade cabinet for the fictional Fix-It Felix Jr. game on display on the show floor. Disney also released a browser-based Flash-based version of the Fix-It Felix Jr. game as well as iOS, Android, and Windows Phone versions, with online Unity-based versions of Sugar Rush and Hero's Duty. A second trailer for the film was released on September 12, 2012, coinciding with Finding Nemo 3D and Frankenweenie, along with its final updated movie poster. To promote the home media release of Wreck-It Ralph, director Rich Moore produced a short film titled Garlan Hulse: Where Potential Lives. Set within the movie's universe, the mockumentary film was designed as a parody of The King of Kong. Wreck-It Ralph was released on Blu-ray Disc (2D and 3D) and DVD in North America on March 5, 2013, from Walt Disney Studios Home Entertainment. The film was made available for digital download in selected regions on February 12, 2013. Wreck-It Ralph debuted at #1 in Blu-ray and DVD sales in the United States. Wreck-It Ralph grossed $189.4 million in North America and $281.8 million in other countries, for a worldwide total of $471.2 million. It was the 14th-highest-grossing film of 2012, and the fourth-highest-grossing 2012 animated film. In North America, the film debuted with $13.5 million, an above-average opening-day gross for an animated film released in November. During its opening weekend, the film topped the box office with $49 million, making it the largest opening for a Walt Disney Animation Studios film at the time. The film fell 33% to $33 million in its second weekend, finishing second behind newcomer Skyfall. Outside North America, Wreck-It Ralph earned $12 million on its opening weekend from six markets. Among all markets, its three largest openings were recorded in the UK, Ireland and Malta ($7.15 million), Brazil ($5.32 million with weekday previews), and Russia and the CIS ($5.27 million). In total grosses, the three largest markets were the UK, Ireland and Malta ($36.2 million), Japan ($29.6 million), and Australia ($24.0 million). The review-aggregation website Rotten Tomatoes reports that 87% of critics have given the film a positive review, based on 183 reviews with an average score of 7.42/10. The site's consensus reads: "Equally entertaining for both kids and parents old enough to catch the references, Wreck-It Ralph is a clever, colorful adventure built on familiar themes and joyful nostalgia." At Metacritic, which assigns a normalized rating from mainstream critics, calculated a score of 72 out of 100, based on 38 critics, indicating "generally favorable reviews". The film earned an "A" from audiences polled by CinemaScore. Roger Ebert of the Chicago Sun-Times gave the film 3 out of 4 stars and wrote, "More than in most animated films, the art design and color palette of Wreck-It Ralph permit unlimited sets, costumes, and rules, giving the movie tireless originality and different behavior in every different cyber world." A.O. Scott of The New York Times wrote, "The movie invites a measure of cynicism – which it proceeds to obliterate with a 93-minute blast of color, noise, ingenuity and fun." Peter Debruge of Variety stated, "With plenty to appeal to boys and girls, old and young, Walt Disney Animation Studios has a high-scoring hit on its hands in this brilliantly conceived, gorgeously executed toon, earning bonus points for backing nostalgia with genuine emotion." Betsy Sharkey of the Los Angeles Times said, "The movie's subversive sensibility and old-school/new-school feel are a total kick," while Justin Lowe of The Hollywood Reporter wrote, "With a mix of retro eye-candy for grown-ups and a thrilling, approachable storyline for the tykes, the film casts a wide and beguiling net." Conversely, Christopher Orr of The Atlantic found it "overplotted and underdeveloped." The film's score was composed by Henry Jackman. The soundtrack also features original songs by Owl City, AKB48, Skrillex with the remix Noisia, and Buckner & Garcia. Early in the development process, Robert Lopez and Kristen Anderson-Lopez wrote an original song for the film; it was later cut out. 1. "When Can I See You Again?" In addition to the Flash version of the Fix-It Felix Jr. game, Disney released a tie-in side-scrolling platform game called Wreck-It Ralph for the Wii, Nintendo 3DS, and Nintendo DS, to mostly negative reviews. The arcade style side-scrolling game was developed by PipeWorks and published by Activision and serves as a "story extension" to the film. Taking place following the events of the film, players may play as Wreck-It Ralph or Fix-It Felix, causing or repairing damage, respectively, following another Cy-Bug incident. Game levels are based on the locations in the film like the Fix-It Felix Jr., Hero's Duty, and Sugar Rush games as well as Game Central Station. It was released in conjunction with the film's release, in November 2012. In October 2012, Disney released fully playable browser-based versions of the Hero's Duty and Sugar Rush games on the new official film site. A mobile game titled Wreck-it Ralph was released in November 2012 for iOS and Android systems, with a Windows Phone 8 version following almost a year later. Initially, the game consisted of three mini-games, Fix-it Felix Jr., Hero's Duty and Sweet Climber, which were later joined by Turbo Time and Hero's Duty: Flight Command. The game was retired on August 29, 2014. Ralph also appears in Sega's Sonic & All-Stars Racing Transformed as a playable guest character. Ralph and Vanellope appear as playable characters in Disney Infinity as well (voiced by Brian T. Delaney and Sarah Silverman, respectively); the Disney Store released their individual figures on January 7, 2014. A combo "toy box pack" of the two figures with Sugar Rush customization discs was released April 1, 2014, from the Disney Store. Wreck-It Ralph is a playable world on the mobile game Disney Crossy Road. Ralph made his debut appearance in the Kingdom Hearts video game series in Kingdom Hearts III, serving as a Link summon. A world based on Wreck-It Ralph was added to the mobile game Kingdom Hearts Union χ as part of an update in April 2019. In an interview on October 25, 2012, director Rich Moore said that he and Disney had ideas about a sequel that would bring the characters up to date and explore online gaming and console gaming. Moore stated that many of the crew and voice cast are open to the sequel, believing that they have "barely scratched the surface" of the video game world they envisioned. He also stated that he plans to include Mario and Tron in the sequel. In a 2014 interview, the film's composer Henry Jackman said that a story for the sequel is being written. In July 2015, John C. Reilly said he had signed on to reprise his role of Ralph in a projected sequel. On March 24, 2016, Rich Moore stated that a sequel is still being planned. Moore also hoped to specifically include an appearance from Mario, citing a "good relationship with Nintendo", however Mario does not appear in the final film. On June 30, 2016, Walt Disney Animation Studios announced that the sequel would be released on March 9, 2018, with John C. Reilly, Rich Moore, and writer Phil Johnston attached. John C. Reilly and Sarah Silverman would reprise their roles as Wreck-It Ralph and Vanellope von Schweetz respectively. The plot focuses on "Ralph leaving the arcade and wrecking the Internet". In April 2017, the sequel was pushed to November 21, 2018 due to A Wrinkle in Time taking over its date. ^ a b c d e Frye, Jim (Spring 2012). "Ralph's Wrecking Crew". Disney twenty-three. Disney Enterprises. 4 (1): 43. ^ a b Debruge, Peter (October 26, 2012). "Wreck-it Ralph". 'Variety. Retrieved November 4, 2012. ^ a b c "Wreck-It Ralph (2012)". Box Office Mojo. Retrieved April 19, 2013. ^ Buchanan, Jason. "Wreck-It Ralph". Allmovie.com. Retrieved November 19, 2012. ^ a b c d e "Disney Announces CG Comedy Adventure Wreck-It Ralph" (Press release). Walt Disney Animation Studios via ComingSoon.net. June 13, 2011. Archived from the original on December 29, 2012. Retrieved June 13, 2011. ^ "'Wreck-It Ralph' Inspires Technological Innovations at Walt Disney Animation Studios". The Walt Disney Company. November 1, 2012. Retrieved December 20, 2016. ^ Wloszczyna, Susan (June 4, 2012). "'Wreck-It Ralph' powers up with John C. Reilly". USA Today. Retrieved December 20, 2016. ^ Crook, Simon (June 13, 2011). "Wreck-It Ralph Review". Empire. Retrieved December 20, 2016. ^ Derschowitz, Jessica (October 30, 2012). "'Wreck-It Ralph' Premiere Brings Out Stars". CBS News. Archived from the original on December 29, 2012. Retrieved November 12, 2012. ^ a b King, Susan (February 2, 2013). "40th Annie Award nominees and winners list". Los Angeles Times. Retrieved February 3, 2013. ^ Globe, Golden (December 13, 2012). "Golden Globes 2013: full list of nominations". guardian.co.uk. London. Retrieved January 3, 2013. ^ a b "'2013 Oscar Nominees". Academy of Motion Picture Arts and Sciences. January 10, 2013. Archived from the original on January 10, 2013. Retrieved February 3, 2013. ^ a b Khatchatourian, Maane (April 25, 2017). "Disney Dates 'Lion King,' 'Frozen 2,' Pushes Fifth 'Indiana Jones' Film to 2020". Variety. Retrieved April 25, 2017. ^ a b Eisenberg, Eric (August 21, 2011). "'Wreck-It Ralph' Footage from D23 Features 8-Bit Action, Plenty of Cameos". CinemaBlend.com. Archived from the original on December 29, 2012. Retrieved August 30, 2011. ^ Cerabona, Ron (April 29, 2013). "Giving voice to an old-timer". The Sydney Morning Herald. Retrieved November 19, 2014. ^ a b c d e f g h i "Walt Disney Animation Studios Reveals Key Cast Members Joining 'Wreck-It-Ralph'" (Press release). Walt Disney Animation Studios. July 19, 2012. Archived from the original on December 29, 2012. Retrieved July 19, 2012. ^ Chitwood, Adam (September 28, 2012). "New Character Images and Descriptions from WRECK-IT-RALPH". =Collider. Retrieved September 29, 2012. ^ "'Wreck-It Ralph Movie Production Notes". Walt Disney Animation Studios via CineMovie. October 22, 2012. Archived from the original on December 29, 2012. Retrieved October 24, 2012. ^ Cruz, Tiffany (October 14, 2012). "Wreck-It Ralph Voice Recording Session and Press Day". Fabulous Finds by Tiffany. Archived from the original on December 29, 2012. Retrieved October 23, 2012. ^ a b Vespe, Eric "Quint" (July 13, 2012). "Wreck-It Ralph shows 10 minutes at Comic-Con and wins the audience by being the Who Framed Roger Rabbit for video game geeks!". Ain't It Cool News. Retrieved July 13, 2012. ^ "Nick Grimshaw lands Wreck-It Ralph film role". The Sun. UK. Retrieved December 9, 2012. ^ a b c "Wreck-It Ralph Trailer #2". Walt Disney Animation Studios via YouTube. September 12, 2012. Retrieved September 12, 2012. ^ a b c d Breznican, Anthony (April 25, 2012). "CinemaCon 2012: Classic video game characters to cameo in Disney's 'Wreck-It Ralph'". Entertainment Weekly. Time Warner. Retrieved April 25, 2012. ^ "Characters – Wreck-It Ralph". Disney.com. Retrieved October 15, 2012. ^ "Wreck-It Ralph "Game Changer" TV Spot". Walt Disney Animation Studios via YouTube. September 24, 2012. Retrieved October 15, 2012. ^ Ashurst, Sam (September 17, 2012). "Wreck-It Ralph's Skrillex Cameo Revealed". Total Film. Retrieved October 23, 2012. ^ a b Schedeen, Jesse (June 8, 2012). "The Familiar Faces of Wreck-It Ralph". IGN. Retrieved June 12, 2012. ^ Kohler, Chris (June 11, 2012). 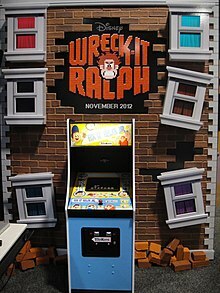 "Disney Builds Amazing Fake Wreck-It Ralph Arcade Machine". Wired. Retrieved July 8, 2015. ...a non-working arcade cabinet clearly modeled on Nintendo's design for Donkey Kong,..
^ a b c d Breznican, Anthony (August 20, 2011). "Disney's D23: Secret lives of video game characters revealed in 'Wreck-It Ralph'". Entertainment Weekly. Time Warner. Retrieved February 7, 2012. ^ Connelly, Brendon (February 16, 2012). "Chun-Li, Q-Bert and Plenty of Video Game Gags in Superb New Image from 'Wreck-It Ralph'". Bleeding Cool. Archived from the original on June 7, 2012. Retrieved June 5, 2012. ^ a b Cooper, Hollander; Gilbert, Henry (October 19, 2012). "Wreck-it Ralph – 9 amazing things you couldn't possibly know about the movie". Games Radar. Retrieved October 23, 2012. ^ a b c d e Hillard, Kyle (February 11, 2013). "Wreck-It Ralph's Director Answers Our Questions". Game Informer. Retrieved February 11, 2013. ^ a b Patches, Matt. "How 'Wreck-It Ralph' Unlocked Its Unbelievable Cast of Video Game Legends". Hollywood.com. Retrieved November 24, 2012. ^ "Wreck-It Ralph Interview (SDCC 2012)". YouTube. July 12, 2012. Retrieved July 24, 2012. ^ a b Pearson, Ben (October 30, 2012). "Video Interview: 'Wreck-It Ralph' Director Rich Moore on Mario & More". FirstShowing.net. ^ a b c d Orland, Kyle (November 5, 2012). "From Zangief to Hero's Duty: A gamer's guide to Wreck-It Ralph". Ars Technica. Retrieved December 16, 2012. ^ Robinson, Tasha (November 1, 2012). "Wreck-It Ralph". The A.V. Club. Retrieved November 19, 2012. ^ Kohler, Chris (October 26, 2012). "Gaming In-Jokes Don't Overpower Heartwarming Wreck-It Ralph". Wired. Retrieved November 19, 2012. ^ a b McKinney, Luke (November 12, 2012). "Leeroy Jenkins Lives! The 6 Best Video Game References In 'Wreck-It Ralph'". MovieLine. Retrieved January 10, 2013. ^ Lussier, Germain (August 2, 2012). "50 Things You Didn't Know About Disney Animation's 'Wreck-It Ralph;' Plus New Images". Slash Film. Retrieved June 19, 2013. ^ Rose, Nathan (October 28, 2012). "Disney's Wreck-It Ralph, Sunday, October 28, 2012". Magical Definition. Archived from the original on October 31, 2012. Retrieved November 2, 2012. ^ Hill, Jim (February 19, 2013). "Rich Moore Looks Back at the Roads Not Taken With Disney's Wreck-It Ralph". The Huffington Post. Retrieved February 24, 2013. ^ a b c d Nicholson, Max (August 6, 2012). "Wreck-It Ralph Creators on Using Actual Video Game Characters". IGN. Retrieved August 7, 2012. ^ a b c Langsworthy, Billy (February 8, 2013). "INTERVIEW: Wreck-It Ralph director talks bringing games to film". MCV. Retrieved February 10, 2013. ^ Ashurst, Sam (September 17, 2012). "Wreck-It Ralph's Skrillex cameo revealed". Total Film. ^ a b c Sullivan, Kevin (February 12, 2013). "Exclusive: 'Wreck-It Ralph' Deleted Scene Travels To Entirely New Game World". MTV. Archived from the original on February 14, 2013. Retrieved February 13, 2013. ^ "All The World's a Virtual Stage in Disney's New Camera Capture System". Animation World Network. Retrieved January 26, 2015. ^ "'Wreck-It Ralph' Shines Bright with New Lighting and Effects Technology | Animation World Network". Awn.com. November 2, 2012. Retrieved February 21, 2014. ^ Gallagher, Brian (April 4, 2011). "Monsters University Pushed to 2013". Movieweb.com. Retrieved August 28, 2011. ^ Collura, Scott (September 2, 2011). "Wreck-It Ralph Screenshots". IGN. Retrieved November 29, 2011. ^ Gettell, Oliver (February 24, 2013). "Oscars 2013: 'Paperman' wins animated short prize". Los Angeles Times. Retrieved March 26, 2013. ^ Amidi, Amid (April 25, 2012). "The Poster for Disney's 'Paperman'". Cartoon Brew. Archived from the original on April 29, 2012. Retrieved April 26, 2012. ^ "Spread the word: The first trailer..." Disney Animation via official Twitter page. May 25, 2012. Retrieved May 25, 2012. Spread the word: The first trailer for Wreck-It Ralph will debut June 6. ^ Hannett, Michelle (June 6, 2012). "Disney's WRECK-IT RALPH Trailer Debuts; Plus New Character Photos Of John C. Reilly, Sarah Silverman & Jane Lynch". We Are Movie Geeks. Retrieved January 13, 2019. ^ Kohler, Chris (June 11, 2012). "Disney's Amazing Fake Wreck-It Ralph Arcade Machine". Wired. Retrieved June 11, 2012. ^ Nath, Debabrata (June 12, 2012). "Wreck-It Ralph gets official game". VG247. Retrieved June 12, 2012. ^ Anderton, Ethan (September 12, 2012). "Must Watch: Another Spectacular Trailer for Disney's 'Wreck-It Ralph'". FirstShowing.net. Retrieved January 13, 2019. ^ Chitwood, Adam (September 12, 2012). "New Full-Length Trailer for Disney's WRECK-IT RALPH [Updated with Poster]". Collider. Retrieved February 22, 2019. ^ "Wreck-It Ralph spoofs King of Kong with "Garlan Hulse: Where Potential Lives"". Warp Zoned. Retrieved March 13, 2013. ^ West, Kelly. "Wreck-It Ralph Gets An Early Digital Release, DVD/Blu-ray Set For March". Cinema Blend. Retrieved January 3, 2013. ^ "Disney announces Wreck-It Ralph will arrive for download before DVD, Blu-ray". Engadget. Retrieved January 11, 2013. ^ "'Wreck-It Ralph' wrecks 'Breaking Dawn Part 2's' DVD reign". The Hollywood Reporter. March 28, 2012. Retrieved March 18, 2013. ^ "2012 Yearly Box Office Results — Box Office Mojo". boxofficemojo.com. Retrieved January 26, 2015. ^ Subers, Ray (November 3, 2012). "Friday Report: 'Ralph' Rules, 'Flight' Blasts Off". Box Office Mojo. Retrieved November 4, 2012. ^ Subers, Ray (November 4, 2012). "Weekend Report: 'Ralph' Wrecks It, 'Flight' Cruises". Box Office Mojo. Retrieved November 4, 2012. ^ Subers, Ray (December 1, 2013). "Weekend Report: 'Catching Fire,' 'Frozen' Set Thanksgiving Records". Box Office Mojo. Retrieved December 10, 2013. ^ Finke, Nikki (November 10, 2012). "'Skyfall' Explodes With $515M Worldwide As Biggest Bond With $90M Domestic Opening; Spielberg's 'Lincoln' Huge $900K In 11 Runs". Deadline Hollywood. Retrieved November 2, 2018. ^ Subers, Ray (November 4, 2012). "Around-the-World Roundup: 'Skyfall' Adds Incredible $156 Million Overseas". Box Office Mojo. Retrieved January 8, 2013. ^ a b "Wreck-It Ralph (2012) - International Box Office Results — Box Office Mojo". boxofficemojo.com. Retrieved January 26, 2015. ^ "Wreck-it Ralph (2012)". Rotten Tomatoes. Fandango Media. Retrieved February 22, 2019. ^ "Wreck-It Ralph Reviews". Metacritic. CBS Interactive. Retrieved November 22, 2018. ^ "'Wreck-It Ralph' Review: Arcade-Generation 'Roger Rabbit' Is Worth Every Quarter". TheWrap. Retrieved January 26, 2015. ^ Ebert, Roger (October 31, 2012). "Wreck-it Ralph". Chicago Sun-Times. Retrieved November 4, 2012. ^ Scott, A.O. (November 1, 2012). "Wreck-it Ralph". The New York Times. Retrieved November 4, 2012. ^ Sharkey, Betsy (November 2, 2012). "Wreck-it Ralph". Los Angeles Times. Retrieved November 4, 2012. ^ Lowe, Justin (October 26, 2012). "Wreck-it Ralph". The Hollywood Reporter. Retrieved November 4, 2012. ^ Orr, Christopher. "'Wreck-It Ralph' Aims for Pixar ... and Misses". The Atlantic. Retrieved November 4, 2012. ^ "40th Annual Annie Awards > Nominees: Outstanding Achievement, Music in an Animated Feature Production". International Animated Film Society. Retrieved December 16, 2012. ^ Hammond, Pete (December 11, 2012). "'Lincoln', 'Les Miserables', 'Silver Linings' Top List Of Nominees For 18th Annual Critics Choice Movie Awards". Deadline Hollywood. Retrieved December 11, 2012. ^ "70th Golden Globe Awards Nominations". Deadline Hollywood. December 13, 2012. Retrieved December 13, 2012. ^ "2013 Golden Reel Award Winners & Nominees: Feature Films". Motion Picture Sound Editors. Archived from the original on February 25, 2013. Retrieved February 27, 2013. ^ Breznican, Anthony (December 5, 2012). "National Board of Review highlights 'Compliance' actress Ann Dowd and 'Zero Dark Thirty'". Entertainment Weekly. Retrieved December 7, 2012. ^ "Nominations for the 11th Annual VES Awards". ComingSoon.net. January 7, 2013. Retrieved January 7, 2013. ^ "Walt Disney Animation Studios' "Wreck-It Ralph" Scores Big with Composer Henry Jackman, Plus Original Music from Skrillex, AKB48, Owl City and Buckner & Garcia" (Press release). Walt Disney Record via PR Newswire. September 13, 2012. Retrieved September 29, 2012. ^ Green, Scott (October 30, 2012). "Video: AKB48 'Wreck-It-Ralph' Theme Preview". CrunchyRoll.com. Archived from the original on November 21, 2012. Retrieved November 21, 2012. ^ Lang, Derrik J. (February 22, 2013). "Best Animated Feature: 'Brave,' 'Wreck-It Ralph' Battle For Oscar". The Huffington Post. ^ "Wreck-It Ralph (Soundtrack)". Amazon. Retrieved September 29, 2012. ^ "Welcome to Failure Town". NintendoWorldReport. November 15, 2012. Retrieved April 20, 2013. ^ "Wreck-It Ralph game review – cinematic disaster". Metro. February 8, 2013. Retrieved April 10, 2013. ^ Young, Amanda (June 25, 2012). "Activision Publishing And Disney Interactive Announce Collaboration To Create Wreck-it Ralph™ Video Game" (Press release). Retrieved June 25, 2012. ^ "Play Disney's Wreck-It Ralph's Fix-It Felix Jr and other Games from the New Animated Film!". Beyond the Marquee. October 29, 2012. Retrieved November 17, 2013. ^ Prasad (November 18, 2012). "Wreck-It Ralph' for iOS and Android game review". GSM Arena. Retrieved November 17, 2013. ^ Sabri, Sam (September 3, 2013). "Disney's Wreck-it Ralph game now available for Windows Phone, nearly a year after the movie". Windows Phone Central. Retrieved November 17, 2013. ^ Calimlim, Aldrin (December 14, 2012). "It's Time To Drive Fast And Go Turbo In Wreck-It Ralp". AppAdvice. Retrieved November 17, 2013. ^ Calimlim, Aldrin (March 7, 2013). "Take Flight And Take Command In The New Mini-Game In Wreck-It Ralph". AppAdvice. Retrieved November 17, 2013. ^ "Retired Disney Interactive Games". Disney Interactive. August 29, 2014. Retrieved November 1, 2014. ^ Keegan, Rebecca (July 13, 2012). "Comic-Con: How 'Wreck-It Ralph' infiltrated the game industry". Los Angeles Times. Retrieved July 14, 2012. ^ McIsaac, Colin (January 15, 2013). "Disney Infinity Revealed—Features Wreck-It Ralph, Jack Skellington, Davy Jones, and More!". Zelda Informer. Retrieved January 21, 2013. ^ "Vanellope Figure — Disney Infinity". Disney Store. Archived from the original on January 16, 2014. Retrieved January 13, 2014. ^ "Wreck-It Ralph Figure — Disney Infinity". Disney Store. Archived from the original on January 16, 2014. Retrieved January 13, 2014. ^ "Disney Infinity Wreck-It Ralph Toy Box Pack — Wreck-It Ralph and Vanellope -- Pre-Order". Disney Store. Archived from the original on January 16, 2014. Retrieved January 13, 2014. We expect this item to be available by 04/01/2014. ^ "'Disney Crossy Road' Secret Characters: Unlock All Mystery Characters You Can't Buy With This Cheat List". player.one. April 11, 2016. ^ McWhertor, Michael (May 18, 2018). "Kingdom Hearts 3 is a whimsical spectacle full of Disney cheer". Polygon. Retrieved May 18, 2018. ^ Disney Wreck-It Ralph Director Rich Moore Is a Huge Gamer. GamerHub Videos. October 25, 2012. Event occurs at 4:22. Retrieved October 25, 2012. ^ Dekel-Daks, Tal (February 8, 2013). "'Wreck-It Ralph' director Rich Moore wants Nintendo's Mario for sequel". Digital Spy. Retrieved September 24, 2013. ^ Vejvoda, Jim (February 4, 2013). "Wreck-It Ralph Director Wants Tron in the Sequel". IGN. Retrieved September 24, 2013. ^ Roberts, Sheila (April 1, 2014). "Composer Henry Jackman Talks Captain America: The Winter Soldier, His Influences, Wreck-It Ralph 2, The Interview, and More". Collider.com. Retrieved April 3, 2014. I can't tell you more, not because I'm being coy, but I believe that it is officially on the cards. I don't know any more other than a story is indeed being written. ^ Otterson, Joe. "John C. Reilly Says He Will Star in 'Wreck-It Ralph' Sequel". TheWrap. Retrieved July 13, 2015. ^ Tilly, Chris (March 24, 2016). "Wreck-It Ralph 2 Still Happening, Might Feature Mario". IGN. Retrieved March 24, 2016. ^ Moore, Rich; Johnston, Phil; Reilly, John C. (June 30, 2016). "Breaking news live from Walt Disney Animation Studios!". Disney verified Facebook page. Retrieved June 30, 2016. ^ Snetiker, Marc (June 30, 2016). "Wreck-It Ralph 2 officially announced at Disney". Entertainment Weekly. Retrieved June 30, 2016. ^ McClintock, Pamela (April 25, 2017). "'Star Wars: Episode IX' Sets Summer 2019 Release Date". The Hollywood Reporter. Archived from the original on April 26, 2017. Retrieved September 22, 2018. Lee, Jennifer; Malone, Maggie (2012). The Art of Wreck-It Ralph. The Art of Disney (1st ed.). Chronicle Books. ISBN 978-1452111018. Wikimedia Commons has media related to Wreck-It Ralph.